Stop! Put down that Cap’n Crunch! Yes, it’s tempting to just make a bowl of cereal when you get home late from work or the movies or when you want a midnight snack. For just a few minutes more, you can whip up a terrific (and even romantic) little meal and serve it with a glass of easy-drinking wine for a satisfying supper. Here are some recipe ideas and wines to go with! Omelettes are a very satisfying meal at any time of day and can be great with many wines. The keys to making a good omelette are a splash of water to keep the eggs loose, keeping the pan at a moderate temperature, and always using butter. For my omelette, I used 4 eggs since we were 2, and I found left over grilled chicken breast, an avocado, and some Havarti cheese. Total meal prep time (including opening bottle of wine) was 10 minutes. I had the Zind-Humbrecht Pinot Blanc 2011 with mine, but the WillaKenzie Estate Pinot Gris 2012 or the Cave de Lugny Macon Lugny Les Charmes Chardonnay 2013. How can anyone forget the image of Dagwood standing in the kitchen with a sandwich stacked a mile high? After rummaging through the fridge, I created a turkey breast, prosciutto, provolone, lettuce, and tomato, topped with a fried egg and served on sliced sourdough. 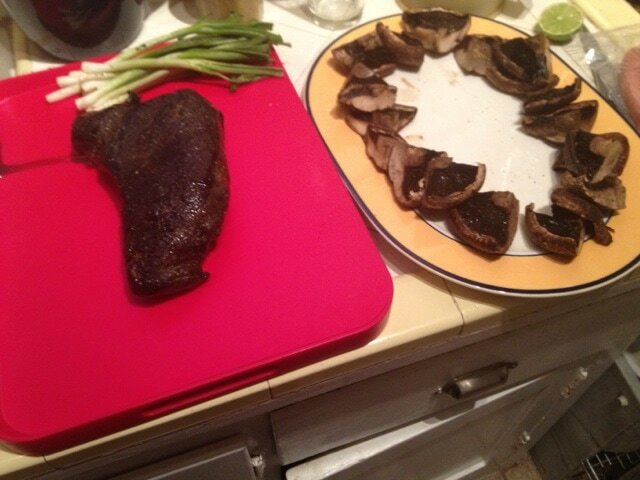 Total meal prep time was 12 minutes, and the wine of the night was the Henry Fessy Morgon 2010. The Commanderie de la Bargemone Rose Coteaux d’Aix en Provence 2013 or the Bouchard Aine & Fils Pinot Noir 2012 would have been equally tasty. This classic Roman pasta dish can be made even when there is next to nothing in the fridge. The name translates to “cheese and pepper” which are the only condiments adorning the pasta. To begin, make enough spaghetti for 2 (buccatini also works, too). In a saute pan, melt a hunk of butter and add a couple of tablespoons of fresh ground black pepper. Toast for a bit until the butter turns a light hazelnut brown. 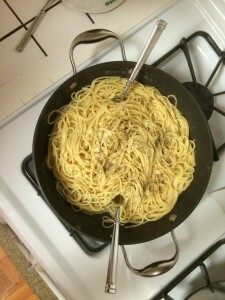 Add a ladle of the pasta cooking water to the saute pan, a pich of salt, and then the cooked pasta. Toss to coat and remove from heat. Finish the pasta with another hunk of butter and 2 big handfuls of grated cheese. The traditional cheese to use is pecorino romano, but in a pinch I have used grana padano and parmigiana. Toss the pasta again and top with some more cheese and a grind or 2 of pepper. Total meal prep (including pasta cooking time, grabbing 2 forks and hunting for a bottle of wine) was 15 minutes. We had the Felsina Berardenga Chianti Classico 2011, and it was awesome. Monte Antico Rosso 2009 and Hauner Salina Hiera 2012 would also be great! For many people Bordeaux is a collectible, a wine for old-fashioned wine drinkers. It wasn’t that long ago that Eric Azimov wrote in the New York Times, “Bordeaux, once the world’s most hallowed region and the standard-bearer for all fine wines, is now largely irrelevant.” This great red wine from the Atlantic coast of France is, however, more affordable and more accessible than ever. Whether it is a cheeseburger on a Tuesday night or the finest filet mignon, there is a Bordeaux for every occasion. Wines with the general appellation of Bordeaux are famous for being great values. The 2010 Saint Sulpice represents one of the best wines this level of Bordeaux has to offer. Located near Saint Emilion, this winery has some prime vineyard land to make great red wine. This easy drinking red has aromas of tea and black currants with soft, round cranberry and currant flavors on the palate. Enjoy the St. Sulpice with a flat iron steak and mashed potatoes. Looking to the North, we have the region of Saint-Estephe. Wines from the cooler zone have a brambly and earthy character, which make them a great accompaniment to any hearty meal. One of my favorite go-to wines over the years has been the Chateau de Pez. This 2008 is dark and brooding with aromas of cedar and cigar box. The cassis fruit is supported chunky tannins. The big, chewy de Pez would be great with a rib eye steak. Pessac-Leognan is the most southern region of Bordeaux. The creative and innovative winemakers of this growing area are making great wines for a very fair price. Ch. Haut Bergey is a great example of this innovative spirit. Purchased in 1991 by Sylvaine Garcin-Cathiard, every effort is made to create a hand-crafted wine of high quality. All of the improvements and hard work have paid off in this amazing 2010. In a vintage full of great wines, the Haut Bergey is a shining example of high quality for a fair price. Aromas of roasted coffee, vanillin, and tobacco lead to ripe black currant fruit on the palate. The sumptuous flavors are supported by fine tannins and bright acidity to the finish. Keep this wine in the cellar for another 5-10 years. I would pair the Haut Bergey with a standing rib roast…now that’s a great Sunday supper! 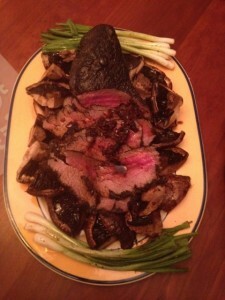 All this talk of Bordeaux has me yearning for some beef. One of my favorite local places to shop (in the Bay Area) is Schaub’s Meat, Fish, & Poultry in the Stanford Mall. They are famous for their “Fred steak,” which is a special dry cured beef that is amazingly delicious. Don’t be alarmed by the dark and blackened exterior— it’s just covering the yummy, beefy inside. Below, is an example of a top sirloin roast that my friends and I shared with a bottle of 2000 Grand Mayne, St. Emilion.